710 Freeway is a ‘diesel death zone’ to neighbors — can vital commerce route be fixed?. For decades, the 710 Freeway has been the commercial spine of Southern California, funneling the trucks carrying thousands of tons of furniture, clothes, televisions and other goods from the ports of Los Angeles and Long Beach into the region’s sprawling network of freeways and warehouses. But the steady stream of freight traffic on the 710, driven by the country’s growing appetite for imported goods and two-day shipping, has taken its toll. The pavement is cracked, bottlenecks are common, and the share of trucks on the freeway is three times higher than engineers in the 1960s expected. Metro to decide on 710 Freeway widening in Long Beach. The Los Angeles County Metropolitan Transportation Authority’s plans to upgrade the heavily-congested 710 Freeway from Long Beach to East Los Angeles may take a significant step forward Wednesday, but with the key caveat that any widening of the freeway would not be allowed until after a decade or so’s worth of other improvements are accomplished. Metro board moves forward with 710 overhaul, but wants to wait on widening. Metro’s Board of Directors unanimously approved a plan today to revamp the 710 freeway from Long Beach to East Los Angeles, but it’s holding off on the most costly and contentious part of the plan: widening much of the route to five lanes in each direction. Instead, the board approved fast-tracking portions of the plan that would be cheaper to implement and wouldn’t result in displacement for residents and business owners in areas close to the freeway. The board still needs to nail down the projects, but they could include parks, air filters in schools, and road improvements near the freeway. Essay Prompt: What Did You Learn in School Today? Why are schools acting like they own our children? We are not sending them to school to be indoctrinated! They are there to learn…. we want history math grammar NOT walkouts … gun control .. and Hate towards our President. Oh, there’s so much to unpack here. I. That’s right, the place to indoctrinate our children is at home, where you get to teach your children your prejudices and your religion, your hatreds and biases. But then again, some do send their kids to school to be indoctrinated: witness the rise of private and religious schools, both of which indoctrinate children with specific values and beliefs systems. So what you are really saying is that you don’t want schools to indoctrinate children with values different than yours. Remember what they sang in South Pacific, “You have to be carefully taught.” But then again, I don’t want my children to be indoctrinated with YOUR values. II. You do want your children to learn history, and how to read and write. Guess what? That exposes them to the fact that protests and walkouts are a part of American History. It teaches them that guns have been a problem throughout American history, and that there have been numerous attempts to control them. It teaches them to read, and to be able to find political analysis and read that. It teaches them to write and to find their voice. It teaches them math, so that they can see the numbers of how many other children are being killed, and how much money the NRA is spending to prevent any regulations on weapons. Any regulation. It teaches them to think critically, which is what a school should do. And these critical thinking students learn the power of their voice from history, and they use it. III. There’s something that people (and especially the NRA) forgets: gun control isn’t all or nothing. Gun control does not mean the government is coming for everyone’s guns. Gun control is increased regulations on some guns, and perhaps the inability to purchase new models of some other types, and increased energy to go after the illegal guns out there. But it isn’t going after the legal gun owners that follow the rules. They aren’t the problem. However, the NRA wants you to think the government is coming after you, so you buy … well, you get it. IV. As for teaching Hatred of the President: I think if there were staff actually teaching hatred during school hours, they would be called out for it. In fact, many have. These children may observe this hatred from society, or their parents, or for that matter, much of the free world. But the meme said specifically during school hours, and that rarely happens from school officials. Official school curriculum does not teach like or dislike of particular politicians. After all, that isn’t on the test. It might teach students about issues that are relevant to their education. But even this gun control debate is not necessarily hatred of the President, it is hatred of his policies. Yes: there is a distinction between policies and the person saying them. What did you learn in school today…? When that should only be done by a man. A post from a friend on FB about immigration inspired this morning rant, which has been percolating for a while. Have you ever asked yourself “why?” with respect to immigration? You hear about “immigrants are taking our jobs”, but why would this be happening? Are they willing to work for less? But isn’t it good business to get the lowest priced workers? Would you be willing to work for less? Perhaps they are more skilled then you? Are they? What can you do to improve your skills that you aren’t doing, but they are? Perhaps they have a better work ethic? Show up on time, less sick days, less absences, more productive? Is it is job you would be willing to do, or is it “beneath you”? Often, the reason an immigrant is hired is not because of the immigrant, but because of what is lacking in the person who isn’t hired. Oh, and if you think they are hiring undocumented immigrants, ask yourself who is hiring them? It isn’t any companies of any size who have to fill out and submit the government paperwork. It is those paying cash under the table to avoid taxes and other overhead. In other words: Businesses who think more about profit than anything else. It is those hiring day works or household workers, who can avoid paperwork. Perhaps that guy you picked up at Home Depot to help you build your wall. Then ask yourself: Who (or what) is pushing you in that direction, and why? Fear of the other, of those who are different, those who have different customs. Fear of loss of power: that those entering the country will be of a different political persuasion than you, and will dilute the power your party or faction has in running the country. That is also, by the way, why Puerto Rico can’t become a state: it will upset the balance. That last one is the real reason immigration is opposed by the Conservatives: Most immigrants, when they come in the country, vote Progressive. More immigrants means dilution of the voting block, dilution of the last stand for $skin_color $political_value $religious_value. I think you can fill in the parameters. Sure, you’ll hear arguments about being fair to those that came before them, who have had to wait in line for years. But since when has this country really been fair to all? What are my thoughts: We should cut much of the immigration red tape and quotas. If you have a clean background (no violent or sexual crimes), if you are not connected with terrorist groups, and you have the ability to support yourself, you should be able to get a limited time work visa. If you can demonstrate by the end of that visa that you were able to be employed, sustain yourself, pay taxes, and pass the citizenship test, you should be able to become a citizen. I’d love to be able to add a minor change: You become a provisional citizen, which can become permanent by voting consistently in a two year election cycle. Once you see the whole immigration debate — and indeed, much of what the party in power does (whatever the party in power is) — as a power play to retain their power, much becomes clear. Back in 1997, I remember watching the Tony Awards and seeing the scene from the nominated musical Steel Pier, with music by Fred Kander and John Ebb, and book by David Thompson. * I loved the dance, and I loved the music. The Tony Award voters didn’t, and the show lost all 11 nominations (including Best Musical, to Titantic, The Musical. However, I quickly went out and got the CD. I still enjoy the score to this day. However, the show faded quickly on Broadway, and never went on tour. In particular, it surprisingly never made it out to Los Angeles. Luckily, the UCLA School of Television, Film, and Theatre (FB) remedied that failure, including the show as part of its 2017-2018 Main Stage Season. It entered my theatre RADAR when I learned of their season (and I should note, given this show, I plan to go back to more of their productions). I started scanning Goldstar for discount tickets; when they came online just before we were about to sit down at Candide a few weeks ago, I grabbed them on the Goldstar app. 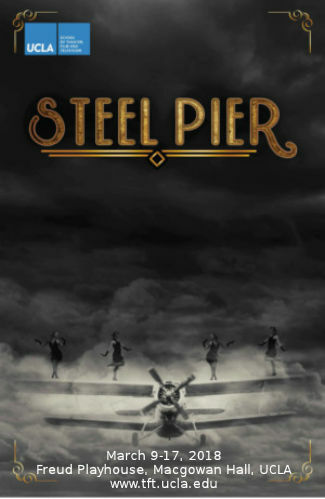 Seeing Steel Pier allowed me to continue my quest: to see musicals I have only heard. I find this helps me understand the story better. That was certainly true for Steel Pier. For those unfamiliar with the show, it is the story of a dance marathon on the famed Steel Pier at Atlantic City. Dance marathons were the Survivor of the 1930s: couples would sign up and dance, continuously, for 45 minutes every hour, until only one couple was left. These marathons could go on for weeks and weeks. All this for a cash prize. Kander, Ebb, and Thomson, working with Scott Ellis and Susan Stroman, used this setting of a story of a C-level celebrity, Rita Racine, the first woman to kiss Charles Lindburgh when he returned from France. Rita and her secret husband, Mick Hamilton, had kept themselves afloat through the dance marathon business, with Mick MCing the marathon, and engineering things so Rita would win. But this marathon was to be Rita’s last … so she thought. Her partner having not shown up, she teams up with a hot-dog aviator for the marathon. From thereon, the show is a marathon of dancing, specialty numbers, and romance, as we learn about all of the couples. We learn of Mick’s plot for Rita, her goals and desires, and who the aviator really is. We also see Rita finally decide to take charge of her life, seizing upon the second chance this marathon granted her. The plot is much more complicated than that; you can read a detailed synopsis on Wikipedia. When the show was first performed on Broadway, critics were expecting another Caberet or Chicago (whose revival had just recently reopened). They instead found a different story — something more spiritual, something less cynical. Their conclusion: They wrote it off as bland, but with strong dancing. It didn’t help that the Rita’s husband and marathon MC, Mick Hamilton, was exposed as a swarmy huckster who used and abused women and people. He was the person that drove the story forward, but was intensely unlikable. Even Kristen Chenowith, for whom this show was her Broadway debut, thought the show might have been something Broadway wasn’t yet ready for. I would tend to agree. In 1997, the NY Times would write: “Mick is set up in tidy opposition to the show’s other male lead, Bill Kelly, a handsome, enigmatic exhibition pilot who falls hard for Rita, his partner in the marathon. You’re right in thinking there’s something otherworldly about this fellow, whose presence tends to set off angel chimes and campy, harmonic celestial voices. Borrowed from vintage movie fantasies like ”Stairway to Heaven,” he represents, as one of the show’s songs baldly puts it, Rita’s ”second chance” at the life she wants.” Back then, 20 years ago, they were seizing on the spiritual aspect of the show. But 2018 is the era of #MeToo, of woman standing up to harassment. It is an era where, on the UCLA campus, they just canned a history professor for such behavior. Today, the show comes across as Rita finally standing up to the manipulator in her life, and kicking him to the curb rather than continuing to put up with his abuse. The aviator’s mystical return is less for him to fulfill his romantic fantasy, but more as the universe providing that second chance, that angel on her shoulder showing Rita that she deserved better, and she can have better than the marathon life. Seeing UCLA’s exhilarating production of Steel Pier makes me think that this is yet another show that is ripe for a Broadway revival. Instead of trotting back the old-chestnuts (I’m looking at you, Hello Dolly and the forthcoming My Fair Lady), explore some shows that may have been ahead of their times, that provide interesting and entertaining new commentary of today’s situations — such as Steel Pier or Sondheim’s Anyone Can Whistle. The world wasn’t ready for Chicago when it premiered in 1985; by the 1990s, the OJ trial had made it relevant. #MeToo makes this show relevant and something to be seen. Under the direction of Adjunct Professor Jeremy Mann, Director of Singing for the UCLA Ray Bolger Musical Program, this production scintillates. There are little things that I presume are directorial touches: a sardonic look here, a playful pause there, aspects of timing and movement, or even background character pairing (I distinctly think that I saw hints of gay characters and a lesbian relationship, which I’m sure weren’t there in ’97), that elevated this production. This production was at the level of a musical I’d see on any mid-size or large stage in Los Angeles — and considering this was student talent — that’s quite a statement. This director deserves credit for molding this student team into a remarkable ensemble. He was aided in this endeavor by Christine Kellogg, who had to work with the student talent to master the art of 1930s dance and the wide variety of styles — and like any marathon, this show had the dancers dancing on-stage for much of the show. A lot of work, and a delight to watch. I contrast this with the recent Dublin Irish Dance I saw. At that show, there was precision, but not fun or joy. Here was dance precision and joy and fun. The talented actors in this show I expect to see again and again in productions in Los Angeles, and am sure they will have further success on Broadway and other stages. At the top of that list was the lead for this show, Shelby Talley (FB), who played Rita Racine, Lindy’s Lovebird. This young woman could sing and dance spectacularly, and she truly captured the dramatic aspects of Rita. This was best seen by watching her face during songs like “Wet” or “Running in Place”, or in the opening number “Willing to Ride”. She was just a delight to watch. Her romantic interest, Bill Kelly, was portrayed by James Olivas (FB). We’ve seen Olivas before in 5-Star Theatrical’s Joseph, and were impressed with him then. He had a lovely warm singing voice, great dancing, and a wonderful acting style that brought both humor and emotion to the role. Again, watch him closely during the “Wet” number, or his playfulness during “Second Chance”. A delight to watch. The other male lead was Jake Levy (FB) as Rita’s secret husband and marathon MC, Mick Hamilton. Levy had the thankless job of being an unlikable character. He did this very well, capturing the smarminess of Mick, the anger, the hatred, and the drive, without the problems that seemingly plagued Gregory Harrison on Broadway. He had a good singing voice, as well as good comic timing, as demonstrated in his number “A Powerful Thing”. In the second tier of characters we have a number of specialty characters. As Mr. Walker, Mick’s assistant and henchman, Nick McKenna (FB) showed a remarkable comic flair, especially during the aformentioned “A Powerful Thing” number — his humorous looks and reactions and singing during that number were just a delight. Another notable performer was Claudia Baffo (FB) as Shelby Stevens. Stevens is the “seen-it-all” oversexed professional marathoner. She captured this well in her specialty number “Everybody’s Girl”, as well as showing the character’s tender side during “Somebody Older”. She was also a strong dancer. A third notable second tier character was Molly Livingston (FB)’s Precious McGuire. This was Kristen Chenowith’s Broadway debut role, and Livingston would have done her proud. She captured both the voice and the humor behind “Two Little Words”, and was a remarkable dancer as well. The remaining second tier characters don’t get singing highlights (technically, the character of Luke Adams (Shelby’s partner) (Ty Koeller (FB)) gets a harmonica solo, but that was covered by the orchestra — in particular, based on his FB, by Scott Senior (FB), who did an excellent job). They do, however, dance and perform like gangbusters. Notable amongst this tier were the “brother and sister team” of Bette Becker and Buddy Becker, portrayed by Katie Emery (FB) and Calvin Brady (FB). Both could dance up a storm, and I was particularly taken by Emery’s dancing. Brady’s Buddy was more of an enigma. For a minute, just given the look, I wasn’t sure if they were playing on the sexuality of the character; later, I thought they were making it out to be a more gay character. Nothing was said; this was performance and look along. I think it worked well, especially for that time. Also notable, in a similar vein, was Marlena Becker (FB)’s Dora Foster, whose dance partner was Olympic Champion Johnny Adel (Justin Baker (FB)). There appeared to be points where Dora was being comforted, in a “very close” fashion, by another female actor (I’m guessing Shelby Barry (FB)’s Hannah Misiano). Again, I’m not sure this was in the original, but I thought it was a nice, in the background, updating touch. Barry’s Hannah was partnered with Grant Hodges (FB)’s Dom Misiano. Rounding out the named dance couples was Precious McGuire’s partner, Happy McGuire, played by Michael Wells (FB). He had a very touching scene in “Somebody Older”. Providing a singing backup to Mick Hamilton were “Mick’s Picks”, a singing trio consisting of Nicolette Norgaard (FB), Naama Shaham (FB), and Aliyah Imani Turner (FB). For most of the show, they don’t get to do more than sing and hold signs, however there were interesting flashes of character during some of the scenes in Act II that I really liked. Unseen, but not unheard, were the pit singers: Michael Fajardo (FB), Molly Grant (FB), Ariana Perlson (FB), and Scott Senior (FB). Music was provided by an onstage orchestra — quite apropos for a marathon in the Big Band era. The orchestra, under the music direction of Dan Belzer (FB), consisted of Sean Bart (FB) and Eric Kong (FB) [Keyboards]; Barry Saperstein (FB) [Drums]; Dorothy Micklea (FB) [Percussion]; Richard Adkins (FB) [Violin]; Beverly Shih [Viola]; Chris Ahn (FB) [Cello]; Jeff Takiguchi [Bass]; Rob Crosby (FB), Ian Dahlberg (FB), Phil Moore (FB), and Scott Senior (FB) [Reeds]; Dustin McKinney (FB) and Tim Rubottom (FB) [Trumpets]; Lori Stuntz (FB) and May Zeng [Trombones], and Julian Sazo [Horn]. The orchestra had a great big band sound. Finally turning to the production and design credits. It should be noted that all production aspects have been executed by students enrolled in UCLA Department of Theatre Courses in scenery, costuming, lighting, sound, and advanced theatre laboratories. That said: The scenic design was by Tatiana Kuilanoff, and worked quite well: consisting of an area in front of the orchestra with a movable bandstand for Mick, and an upper level used for various purposes. Costume design was by Caitlin Kagawa and seemed appropriately period — in particular, the dresses for the ladies and the suspenders for the men. The sound design by Ryan Marsh was appropriately directional and there were some great sound effects; further, the amplification for the performers worked well. Zach Titterington‘s lighting design established mood well. Brynna Mason (FB) was the Stage Manager. There were loads of production staff credits, production crew credits, advisors, and such — all worked well together to do a great job. Alas, I attended the last performance of Steel Pier at UCLA. Those of you who love Kander-Ebb should have been there; it was spectacular. This did put UCLA TFT on my RADAR, however, and I hope to be able to attend more of their shows. As a UCLA alumni (BS, ’82; MS, ’85), I wish I had known about this program during my years on campus — my theatregoing would have been much more than just going to Ackerman Union and buying tickets through the Mutual Agency for the Ahmanson. The last weekend of March is currently open. April looks to be a busy month. It starts with the Clayton Hamilton Jazz Orchestra at the Saroya (the venue formerly known as the Valley Performing Arts Center (VPAC)) (FB) on Thursday April 5, followed by Love Never Dies at the Hollywood Pantages (FB) [as an aside, there was just a great interview with Glen Slater, the lyricist of that show, on Broadway Bullet that is well worth listening to]. The second weekend brings A Man for All Seasons” at Actors Co-op (FB). The third weekend brings Bad Jews at The Odyssey Theatre Ensemble (FB) on Friday, followed by The Hunchback of Notre Dame at 5 Star Theatricals (FB) (nee Cabrillo Music Theatre (FB)) on Saturday, as well as our annual visit to the Original Renaissance Faire. The last weekend of April sees us travelling for a show, as we drive up to San Jose to see friends as well as Adrift in Macao at The Tabard Theatre Company (FB). As you have probably figured out by now, I’m not a big fan of President Trump. I could easily list the reasons, but there is insufficient space in this post. But the President is like a broken clock, which does tell the right time occasionally. His recent “space force” proposal is almost one of those times, and doesn’t deserve the beatings that comedians are giving it. They are portraying the notion like Star Fleet, imaging battles in space and fights against space aliens. But that’s not what he is proposing. This Vox article explains things very well. Think about how our military is structured. Originally, there was the Army and the Navy. Then battles began to be fought by naval groups on the ground, and a new organization was spun off: the Marine Corps. Aircraft were developed, and originally they were managed within the Army. But the segment grew to a point where it was working with Army, Navy, and Marines, and needed to be its own service. In 1947 (IIRC), the Air Force was spun off as its own service. Now consider space. Our national dependence on space has grown: from GPS services to communications to imagery, it is vital to warfighting and defense. Space is primarily run by the Air Force, through the Space and Missile Command. SMC acquires space assets (satellites, launch systems, ground support) and provides the military and civilian support to operate these systems. There are also Army and Navy Space systems, and groups from other services that use space assets. Space is an increasingly contested area, both from commercial use, as well as other nations either putting assets in orbit, or attempting to attack or impede assets in orbit. Trump’s call recognizes that. What he is suggesting is a new service, either at the Department level … or more likely analogous to the Marine Corps within the Department of the Navy. This would give increased visibility to Space and Space assets, especially as the Air Force has to balance funding between aircraft and spacecraft. On the surface, the idea makes sense. When you look at it closer, it doesn’t — not because Space isn’t important, but because Space isn’t yet at the point where it requires a duplicative bureaucracy and all the extra costs and paperwork that would come with an additional corps or service. As with the Cyber battlespace, it can be addressed best at the Command level, utilizing structures currently existing within the USAF and other national security agencies. So, in short, not as silly an idea as it seems on the surface, but one we don’t really need yet. Even a stopped clock tells the right time twice a day. A lot of energy is being spent by folks blathering on about how students shouldn’t have walked out, they should have walked over, or in general, not walked at all. My thoughts? I have absolutely no problem with students — of any age — peaceably protesting about any political interest that is of concern to them. It teaches civic involvement; it teaches that one can stand up to the government when one believes differently; it teaches that one voice can start a change, and many voices can bring about change; it teaches our youth the value of political involvement. As for missing school, more time is wasted on pep rallies and similar school spirit idiocies that teach nothing than an hour of protest. I’m a child of the 1960s. I remember the days when students across high school and college campuses stood up to protest the Vietnam War, because it was their lives that were being used as cannon fodder by the government. They brought about a change in attitude towards the war, they changed society. I remember the days when students across campuses protested for civil rights and equal treatment for minorities, when student idealism brought societal change that benefited everyone. It was protest that started with walking out. Done walked a mile or two. Done all shoes can do. They walked with Martin when he prayed for us. They done all shoes can do. There are those who say students should walk over instead of walking out. Those who say the bullies should make nice with the bullied, and that will solve all the problems. Although that’s a nice theory, it is full of holes (perhaps .44). Those who have been bullied know, once bullying has started, the bully can’t make nice and the problem will go away. The distrust and the hatred has been sown. Bullying must be stopped before it starts. Further, it is an example of blaming the victim, of saying it was the bully who does the shooting. It is an example of diversion of the discussion away from gun regulation. It is an example of black and white thinking: if you walk over and make nice, everyone will forget about the problem with guns and we don’t need to do anything about them. Nothing says you can’t do both: address bullying in schools, and improve regulation of guns. Nothing says you can’t make schools more secure and safe, and regulate guns. They aren’t mutually exclusive. The children will lead us on this issue, because they are the ones bearing the brunt of this violence. It is their lives, and they are taking control of them. They are saying never again. They are saying not here. They are saying that we need to keep guns out of schools — be they in the hands of students, visitors, or teachers. They are saying we increase restrictions on the most dangerous and deadly guns: make them harder to obtain, make those who own them legally more responsible for securing them, and going after those who have them legally. They are telling the gun lobby that their lives are more important than the lobby’s profits or the politicians they own. They are walking to make a statement. Been ‘cross the desert where they never seen snow. But they’re good enough to get us to glory. It’s left shoe, right shoe, don’t know the size. Shoes on the ground and eyes on the prize. And they’re good enough to get us to glory. Last February (February 2017, that is), I wrote about the recent Broadway musical Allegiance: “As you may recall, I’ve been trying to predict shows that will be going on tour. 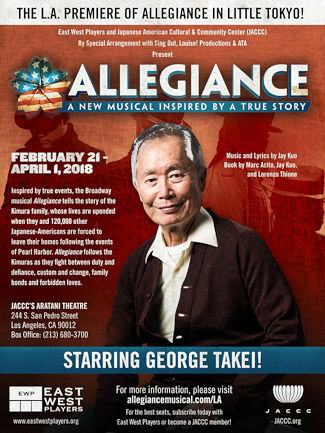 One show I’ve really been interested in is Allegiance (FB), the Broadway musical that George Takei (FB) has been involved with about the Japanese Internment during WWII. The trade papers said a tour would materialize; but the show’s website doesn’t indicate one. I’ve always expected that a tour, if it materialized, would show up at the Ahmanson Theatre (FB) — or that the Ahmanson, recognizing the Japanese community in Los Angeles, might mount a local production. But the Ahmanson hasn’t announced their season yet…” In the time since, two Ahmanson seasons have been announced, without Allegiance. The filmed Broadway production has been shown a few times; indeed, it was that filmed production that led to those February comments. The truth is that the rumored Allegiance tour has not yet materialized. However, the folks behind East-West Players (FB) and the Japanese American Cultural and Community Center (JACCC) (FB) felt that this show was of such importance to the Los Angeles and Southern California community that they didn’t wait for a tour — they opted to mount a local production of the show. Why Southern California? Perhaps because Los Angeles had a large Japanese-American community before World War II. Perhaps because that was one community severely impacted by the forced relocations. Perhaps because Southern California was home to two of the relocation camps, at Manzinar and Santa Anita Racetrack. Perhaps because Southern California remains home to a large Japanese-American community. Perhaps, just perhaps, because the fear that led to the relocations is far too prevalent today, and we, as a community, must say what the Jewish community has been saying for years: “Never Again!”. Perhaps because the best way to ensure this doesn’t happen again is to teach how we can so easily let fear lead us to treat fellow humans as “less than”, and how that no one is “less than”. I guess I should tell you the story of Allegiance, which has a book by Marc Acito (FB), Jay Kuo (FB), and Lorenzo Thione (FB), and music and lyrics by Jay Kuo (FB). According to Wikipedia, the genesis of the show was a chance meeting in the fall of 2008 of George Takei and his husband, Brad, who were seated next to Jay Kuo and Lorenzo Thione. They met again at another show, had some conversations, and this led to the notion of a musical based roughly on George’s experiences as a child in the internment camps. I’ll also note you can find a more detailed version on the show webpage or wikipedia. In short, the show tells the story of the Kimura family from Salinas: the grandfather (Ojii-chan), the father (Tatsuo Kimura), and the two children: Sam and Kei. It starts with Sam, who is a WWII veteran, learning that his sister Kei has died. This opens us into the story and how the rift between them was created. We see the family running a farm and having an American life, and then the Japanese bombing Pearl Harbor. In short order, based on an agreement between the government and the Japanese American Citizens League, led by Mike Masaoka, internment orders go out, and Japanese on the Pacific coast are ordered to camps. The Kimura family has to sell all but what they can carry, and they are taken by force to a camp, Heart Mountain, in the wilds of Wyoming. We learn of life in the camp through a series of scenes, and get to meet two characters in particular: Lt. Hannah Campbell, a nurse at the camp, and Frankie Suzuki, another internee at the camp. Campbell is drawn to Sammy; Frankie to Kei. As time passes, the JACL convinces the government to let Japanese Americans serve in the armed force, in a segregated unit, for suicide missions. A questionnaire goes out that includes loyalty questions so that only loyal Japanese Americans can serve. Tatsuo refuses to answer yes to those questions, and gets hauled away to Tule Lake. Sammy volunteers to serve (against his father’s wishes), and goes on to be one of the few survivors from that batallion. Frankie, on the other hand, resists; when drafted, he organizes resistance in the camp and is arrested. The creates the wedge that drives the story to its conclusion. I’ll let you read the synopsis for more, but you get the drift. Given we’re in the era of identifying “fake news”, I’ll note that Wikipedia relates that the show does conflate experiences across different camps for dramatic effect, and adds a bit more military oversight than existed at Heart Mountain. The production at the JACC drew people from all over, including Japan and Australia. It drew elderly Nisei who were at the camps, and it drew their children and grandchildren to learn their parents experiences. We had the opportunity to talk to some as we were exiting the show; they found this production as moving as I — someone who had family experiences of different camps and different segregation — did. Having seen both the filmed version of the Broadway production and a live production allows that unique comparison: Was this equal to or better than the Broadway version? My wife felt that it was. In general, I did to. Having live performance is always better than filmed-live, there is an immediacy — a feedback loop with the audience — that you just don’t get with film. I have a recollection that the Broadway staging was less dependent upon projection; this production used a lot of rear and surrounding projection to establish the sense of place (as opposed to more traditional set pieces). Was that better? I’ll need to think on that. Certainly the performances were equal to or stronger. Under the direction of Snehal Desai (FB), the cast formed a believable cohesive whole. Desai had a hard task: there were few hard staging set pieces; rather, there were abstract boxes and such, combined with projections. Desai was able to make his actors help the audience believe that what wasn’t there was there. This is something unique to live theatre: realism can be eschewed for the imagery of the mind. The mind can create the dust-filled interment camp much better than any collection of flats and props can. Desai made the abstract become real. The acting ensemble was a mix of actors who had been in the Broadway production combined with other actors and local talent. Circles numbers (e.g., ①) refer to the numbers on the image to the right. In the most prominent position — I hesitate to say lead because he wasn’t the lead actor in the performance of the story, although his character was a leading character — as ① George Takei (★FB) as Sam Kimura/Ojii-chan. As noted earlier, this story was driven by Takei’s personal story. He has shepherded and shaped this production from Day 0, and is almost synonymous with the story (and it will be interesting how this story continues beyond him). But here we are focused on his performance, and for those who are familiar with his work in his younger days (e.g., (cough) Star Trek (cough)), you see a different side of the man — a maturity of performance that is touching. He captures so many different sides of a person, from the embittered Sam at the beginning, the joyful and playful Ojii-chan, to the changed Sam at the end of the story. It is his journal that the audience takes in this story, and it will deeply move you. And that, I feel, is in large part to Takei’s performance, especially in the final scenes. In what I would call the lead performance positions — capturing the younger characters during the war — are ③ Ethan Le Phong (★FB, FB) as Sammy Kimura and ② Elana Wang (★FB, FB) as Kei Kimura. Both were extremely strong and believable performers, with remarkable singing voices. Wang in particular must be singled out: she had to compete with the memory of Lea Salonga on Broadway, and I’m pleased to say that she met and exceeded the expectations there. Both were just delightful to watch and to listen to. As the father of the Kimura clan, ⑦ Scott Watanabe (FB) had the correct measure of old-school Japan to his performance, He also had a wonderfully rich voice that he demonstrated in songs such as “Gaiman”. He has been involved with this production since its inception, and it shows. As the love interests of the main characters, ⑥ Natalie Holt MacDonald (FB) as Hannah Campbell and ⑤ Eymard Cabling (FB) as Frankie Suzuki get a little more fleshing out than characters in the emsemble, but not much. We learn a little of what drives them from the story, but the real embodiment must come from the internal backstory the actor creates. I’m pleased to say the actors do this well; they also have strong singing voices and give a great performance. MacDonald captures well the youth and naivete that Campbell must have had, being thrust into a situation unlike what she expected. Similarly, Suzuki was pushed into a different situation and had to adapt: from pre-law student to resistor. Both actors captured this essence well. The last major named character is the head of the JACL, Mike Masoaka, played by ④ Greg Watanabe (FB). Watanabe captured the officiousness of Masoaka well. The character (in the story) was placed in an untenable position, and a continuing question is whether he should have protested more, of whether he could have achieved something more equitable in that particular society and that particular time. Watanabe’s character also raises — to the contemporary audience — the question of whether we can do more to fight this from happening again. I think that Watanabe captures this well in his performance. The remaining actors form an ensemble that is at times unnamed, and at times becomes various characters in the camps and the story. This group consisted of: ⑩ Cesar Cipriano (FB) [Ben Masaoka (Issei) / Johnny Goto]; ⑬ Sharline Liu (FB) [Mrs. Natsumi Tanaka (Issei)]; ⑪ Glenn Shiroma (FB) [Mr. Masato Maruyama (Issei)]; ⑮ Janelle Dote (FB) [Mrs. Kaori Maruyama (Issei), Dance Captain]; ⑭ Chad Takeda (FB) [Tom Maruyama (Nisei)]; ⑧ Miyuki Miyagi (FB) [Peggy Maruyama (Nisei)]; ⑨ Grace Yoo [Nan Goto (Issei)]; and ⑫ Jordan Goodsell (FB) [Hakujin]. All are strong, but Goodsell stands out in my memory because he gets the thankless job of representing all the military soldiers at Heart Mountain (in other words, the personification of “the bad guy/the government”). I also recall Dote’s performance (at least I think the character was Dote) during the baseball scenes. In general, the ensemble provided great background personifications, great singing, and great movement. Speaking of movement, the choreography was by Rumi Oyama (FB) (who was in the ensemble on Broadway) and was much less the modern dance one sees on stage these days, and more what I presume to be stylized Japanese movement. Whatever it was, it was beautiful to watch and conveyed the story well. The music, under the direction of Music Director Marc Macalintal (FB), with orchestrations by Lynne Shankel, was good and didn’t overpower. It was provided by Macalintal as conductor and primary keyboard and the following musicians: Jenny Chaney (FB) [Asst Music Director, Rehearsal Pianist, Keys 2]; Khris Kempis (FB) [Bass Guitar]; Rebecca Yeh (FB) [Cello]; Michael “Weeble” Boerum (FB) [Drums]; Richie Gonzaga (FB) [B♭ Trumpet, Flugelhorn]; John Jenkins [Trombone, Bass Trombone]; Yu-Ting Wu (FB) [Violin]; Phil Moore [Reed 1]; Hannah Leah Marcus [Reed 2]; and Anthony Villa [Reed 3]. 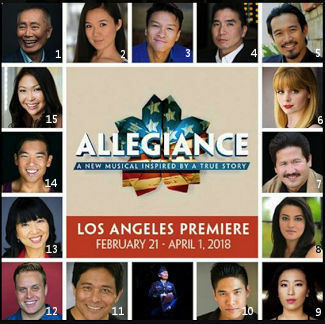 Allegiance continues at the Aratani Theatre at the JACCC until April 1, 2018. Go see it. This is a show you must not miss; it will move you, educate you, and enlighten you, all at the same time. Tickets are available through the East West Players online box office. $20 RUSH TICKETS to Allegiance – A New Musical are available via TodayTix app! Download the app & at 9AM every performance day, a limited number of $20 tickets will be available (first come, first served)! Discount tickets may also be available on Goldstar. Next weekend brings Steel Pier at the UCLA School of Television, Film, and Theatre (FB). The penultimate Friday of March was to bring Billy Porter singing Richard Rodgers at the Saroya (the venue formerly known as the Valley Performing Arts Center (VPAC)) (FB), but that has shifted to June and that weekend brings only the joint TBH Brotherhood/MoTAS Mens Seder. The last weekend of March is currently open.